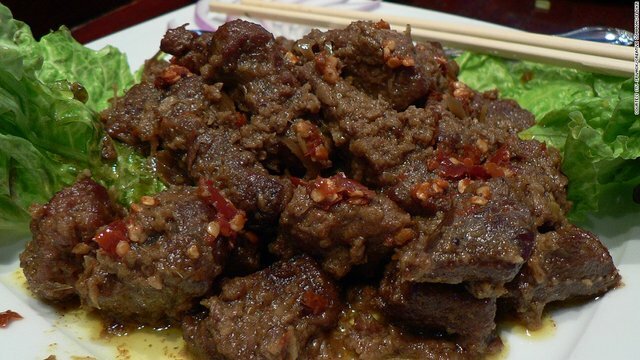 Rendang or Randang is a spicy flavored meat dish that uses a mixture of various herbs and spices. This cuisine is produced from a heated cooking process repeatedly with coconut milk. The cooking process takes hours (usually about four hours) to dry and solid black. At room temperature, rendang can last for weeks. Rendang is cooked in a shorter time and the coconut milk has not dried up called kalio, a light brown golden color. Rendang can be found in Padang Restaurant around the world. This cuisine is popular among the people of Indonesia and countries in Southeast Asia, such as Malaysia, Singapore, Brunei, Philippines, and Thailand. In its home area, Minangkabau, rendang is served in various traditional ceremonies and special occasions. Although rendang is a traditional Minangkabau cuisine in general, each area in Minangkabau has different cooking techniques and use of spices. So, what is your favorite food? Is it among the top 50 foods in the world? If you like this article then upvote it and click here to find related posts.